Trump administration must enforce Marine Mammal Life Protection Act. NEW YORK — Seafood caught from the Sea of Cortez cannot be imported from Mexico to the United States, according to an order issued by the U.S. Court of International Trade on July 30. The court specifically ordered the Trump Administration to ban the importation of Mexican seafood caught in gillnets responsible for the deaths of hundreds of vaquita porpoise, which is now a critically endangered species. Last month’s order, which was the result of a lawsuit filed by conservation groups, came on the heels of UNESCO holding off on declaring the vaquita species as “In-Danger.” The Log obtained and reviewed a copy of the order. Judge Gary S. Katzmann’s order specifically banned the importation of fish and fish products from Mexican fisheries that use gillnets in the Upper Gulf of California (or Sea of Cortez). The vaquita habitat is found in the same area. Chano (bigeye croaker), corvina (drum fish) shrimp and sierra are among the species included in the ban. Animal Welfare Institute, one of the plaintiffs in the Court of International Trade lawsuit, defined gillnets as “fishing nets that hang in the water, indiscriminately catching both target fish and other marine creatures, including vaquita. The vaquita habitat was first surveyed in the 1990s, according to the Court of International Trade order; its population at the time was 567. 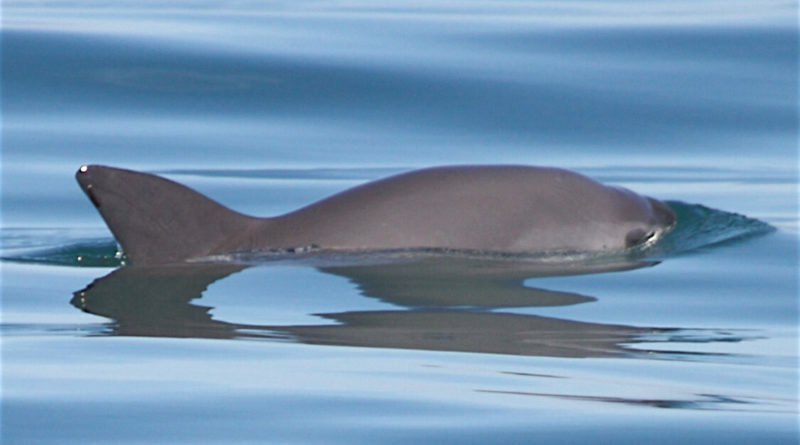 There are as few as 15 vaquitas remaining in the world, according to some estimates. The marine mammal could disappear entirely within the next three years if additional measures aren’t implemented to protect the vaquita, a statement issued by Animal Welfare Institute read. Commercial fishermen have used drift gillnets in the Sea of Cortez to catch certain prized fish; gillnets have been identified as the reason why the vaquita population has rapidly declined to near extinction. “It is undisputed that the cause of the vaquita’s precipitous decline is its inadvertent tangling, strangulation, and drowning in gillnets, which are fishing nets hung in the water to entangle fish and shrimp. The government of Mexico, which regulates fishing practices in the Gulf of California, has banned the usage of gillnets in certain fisheries within the vaquita’s range, though illegal gillnet fishing continues,” the court order stated. “In other fisheries, gillnet fishing remains legal. If current levels of gillnet fishing in the vaquita’s habitat continue, the species will likely be extinct by 2021,” Katzmann continued in his order. Banning drift gillnets might be a rational course of action in the legislative halls of Mexico and the United States, but commercial fisheries aren’t necessarily incentivized to play along. At least one report indicated the market for fish and shrimp illegally caught in gillnets was valued at about $16 million in 2017. At heart of the order – which spawned from a lawsuit filed against the Trump administration earlier this year – is whether the United States should have done enough under the U.S. Marine Mammal Protection Act to require greater action by the Mexican government. The Mexican government, some have alleged, failed to enforce or expand its gillnet ban. The Marine Mammal Protection Act specifically gives the U.S. government the authority to ban seafood imports from foreign fisheries if those fisheries are found to use techniques that would violate federal laws had they been a domestic entity. The United States is also mandated to protect domestic and foreign marine mammals under the Marine Mammal Protection Act. The U.S. Court of International Trade is an official court established under Article 3 of the U.S. Constitution. The court has jurisdiction over civil actions related to customs and international trade laws of the United States. The lawsuit was filed by Center for Biological Diversity, Natural Resources Defense Council and Animal Welfare Institute; Commerce Secretary Wilbur Ross, Treasury Secretary Steven Mnuchin and Homeland Security Secretary Kirstjen Nielsen were among those named as defendants in the lawsuit. The vaquita, which is one of seven species of porpoise worldwide, was listed as an endangered species in 1985, according to Katzmann’s order.